Offers a choice of filter criteria. You then enter a product name, description, or alias to search for. Searches the alias and description fields for each product in addition to the product’s name from the gateway. This lets you query based on the popular names of products in addition to their more cryptic gateway versions. Lists all markets you are logged into. Each market has three servers: price, fill and order. The color indicator tells you the status of the servers. Green indicates all servers for that market are up. Yellow indicates, some servers for that market are up. Red indicates all servers for that market are down. List of product types for the selected market. List of all products for the selected market and Product Types after any filters have been applied. 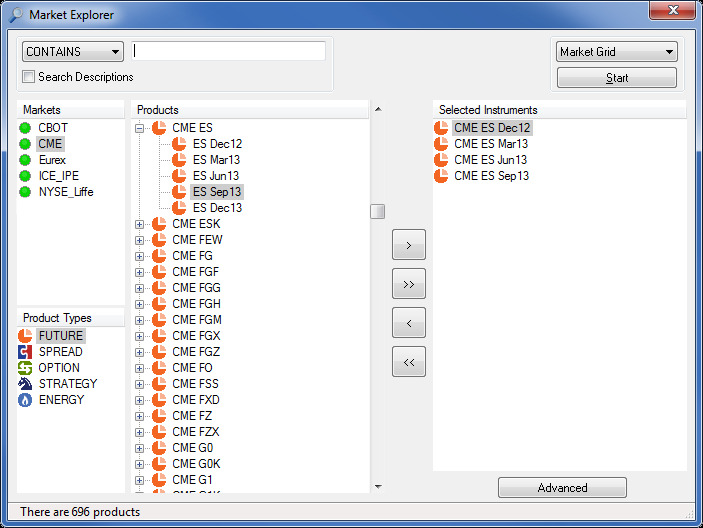 Transfers selected items to and from the Products and Selected Instruments boxes. Shows all products that have been transferred from the Products box. Displays trading windows to which you can open contracts. Note: You must have an X_TRADER Pro license to select Autotrader or Autospreader. Opens the selected trading window with contracts listed in the Selected Instruments box. Displays contracts for Spread, Option and Strategy Product Types.